France's finishing Wednesday lacks sharpness against a spirited Ecuador team. RIO DE JANEIRO – France’s much-vaunted attack missed a series of chances as it drew 0-0 with 10-man Ecuador to reach the knockout stage of the World Cup on Wednesday, while the South Americans bowed out of the tournament. France, which ended with seven points, had scored eight goals in two games and 39 in its previous 11. But the finishing on Wednesday lacked sharpness against a spirit Ecuador side which proved dangerous all game on the break. Ecuador’s chances were hindered at Rio’s Maracana stadium after Antonio Valencia was shown a straight red card in the 50th minute for digging his studs into the leg of French defender Lucas Digne. But Ecuador may feel upset that France center half Mamadou Sakho was not shown a red card in the eighth minute when he appeared to elbow Oswaldo Minda in the face during a France corner. Then, in a late incident off the ball, France forward Olivier Giroud jabbed his elbow in to Gabriel Achilier, who was standing behind him. Deschamps made six changes to his starting lineup, knowing his side was all but assured of advancing, but it upset the balance of his side at times and his new-look defense looked shaky. France came closest to scoring when Antoine Griezmann hit the post in the 47th and then missed a string of late chances as its much-vaunted attacked failed to live up to the hype generated by last Friday’s 5-2 win against Switzerland. Moments later, France striker Karim Benzema played a one-two with Giroud but stroked a casual shot that goalkeeper Alexander Dominguez easily saved. Dominguez had an outstanding match, denying substitute Loic Remy with a brilliant leaping save from the forward’s curling shot in the 87th minute. Giroud should then have scored in injury time but planted a free header straight into Dominguez’s hands. After France had hit the post, Ecuador almost took the lead in the 54th when Cristhian Noboa shot wide. Ecuador kept pushing forward, knowing it had to win because Switzerland was coasting. With more space, France pressured down both flanks and Benzema teed up Paul Pogba, whose shot was well blocked. Benzema was getting on the ball much more and he sent Blaise Matuidi through the middle in the 62nd, but the midfielder placed his shot too close to the goalkeeper. As time for Ecuador ran out, both sides went close. Pogba headed wide from close range and Benzema shot straight at Dominguez after cutting in from the left. Then, Edcuador’s Michael Arroyo burst down the left but center half Laurent Koscielny stood him up well and he shot wide. 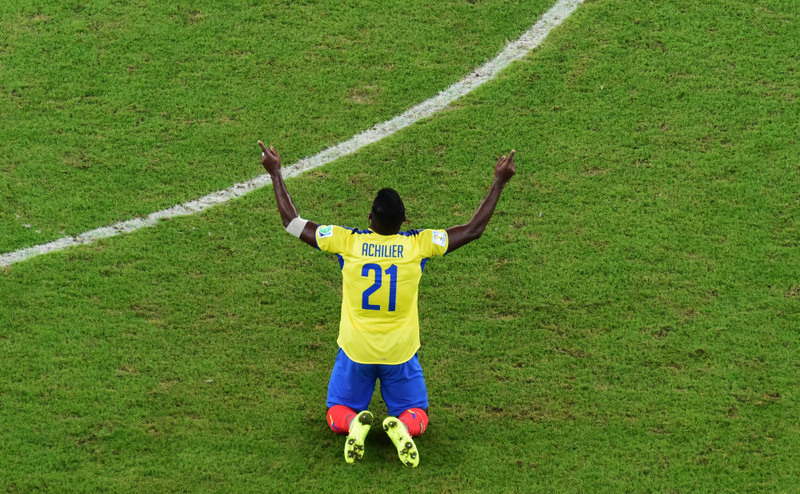 Pogba still had enough energy left to thump a powerful shot narrowly wide, while Ecuador’s last chance came from a corner as France defended desperately to prevent an unexpected defeat.